Posted on 12. Jan, 2013 by Corey in All. Growing up I was a “Hulkamaniac.” I jumped off the arm of the couch and pretended it was the top rope of a wrestling ring. I had a foam two-by-four and dreamed that one day I would marry Miss Elizabeth. Like many kids, I loved to watch the WWF (World Wrestling Federation) and never bothered to care if the wrestling moves were real or fake. The thought of the outcome of the match being pre-choreographed never entered my mind. I would stay in my basement for hours playing with my rubber action figures of George the Animal Steele, Macho Man Randy Savage and Super Fly Jimmy Snuka. Watching the Saturday Morning WWF program on TV was part of my routine, and I selectively created friendships with the kids I knew would be allowed to buy the pay-per-view events on cable at their homes a few times a year. The following of the WWF was large, but the exposure was limited. Magazines and merchandise flooded the store, but finding mass coverage on TV was small. The World Wide Web was not in full swing and storylines among wrestlers remained at a minimum. House shows popped up all over the country, but matches never meant much, as Hulk Hogan, Andre the Giant, Ravishing Rick Rude and others would fight no name athletes, and NEVER lose. I have great memories of attending these house shows with my parents at the Riverfront Coliseum in Cincinnati, Ohio. I usually walked away with a souvenir program and a foam item like Hacksaw Jim Duggan’s two-by-four or Brutus the Barber Beefcake’s foam clippers. But the best memories were the pay-per-view events on cable TV. As memory served it, the WWF had four major events a year, Summer Slam, Royal Rumble, Survivor Series and of course, Wrestlemania. Those were it, but they were “can’t miss events.” Every star was on the big stage together. My memory cannot help me pinpoint the time when wrestling faded in my life. I do not want to say I “outgrew” the sport, but watching College Basketball or Major League Baseball became more important in my life. It has been years since I followed the sport of professional wrestling. It has progressed light years, with the organization now being called the WWE (World Wrestling Entertainment, Inc.), and exposure is at an all-time high. From Monday Night Raw, Thursday Night Smackdown and Saturday Morning Slam, to over 12 separate WWE pay-per-view events, the sport can be found EVERYWHERE. Wrestlers now double as actors, and actors now double as wrestlers. Gone are the no name athletes, as every wrestler seems to have a gimic, a story, an identity. Championship belts seem to be passed around like candy on Halloween and story lines seem harder to keep track of. Watching a Monday Night Raw with a friend recently, it seemed the main attraction was the commentary, and banter on the microphones, with the actual wrestling taking a backseat. A few weeks back I was in Columbia, South Carolina visiting my friends on the Men’s Basketball Staff at the University of South Carolina. After watching the Gamecocks practice, a few of us headed over to the Colonial Life Arena for a WWE Smackdown House Show. I was quite excited to check this event out, knowing that we would have good seats, and it was something I haven’t done in several years. As we passed each usher in the arena, and showed our tickets to them, they continued to push us along, getting closer and closer to the arena floor and the ring. When we finally reached the floor seats, an usher showed us to our seats, first row on the corner of the ring. 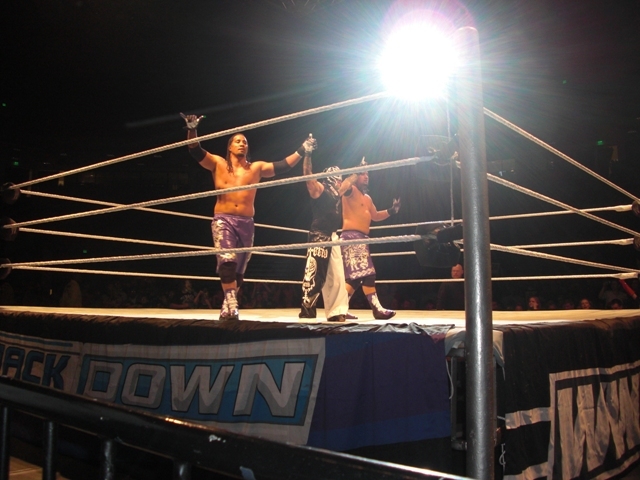 My jaw dropped as I could reach out and almost touch the wrestlers in front of me. To be honest, I had to spent part of the show dodging their sweat as they were flying around the area. 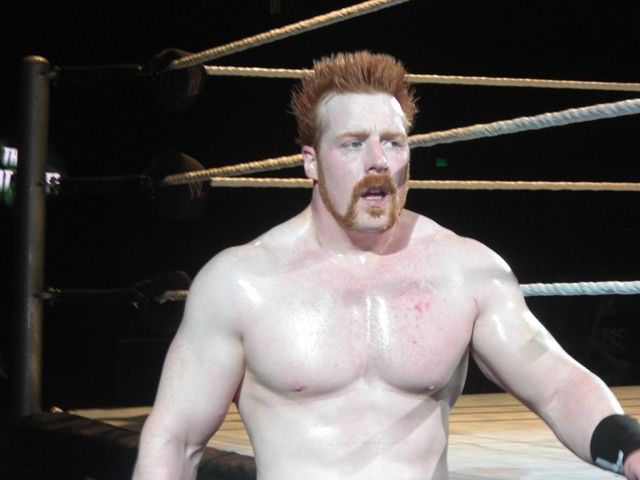 The main event for our house show that night was Sheamus against the Big Show. Clearly this was the biggest match of the night with the two biggest names performing. 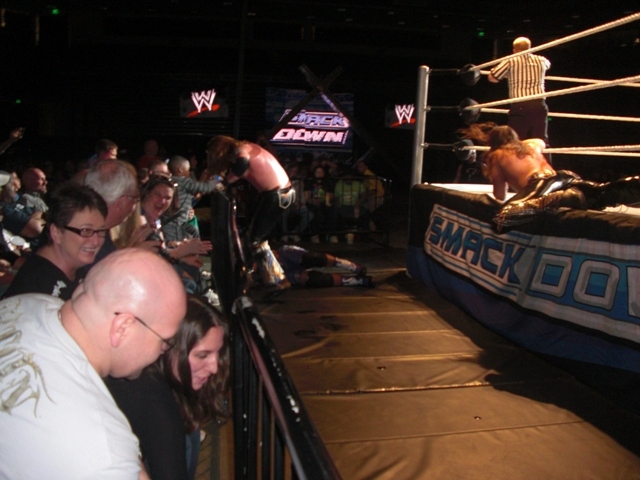 The crowd roared at each move as the match went on for about 30 minutes. I closely watched the two fighters throughout the match, and was quite impressed with the action in front of me. I do not want to bring up the scripted or “fake” parts of the match, as that was not how I was viewing it. I was watching two athletes perform at an extremely high level. 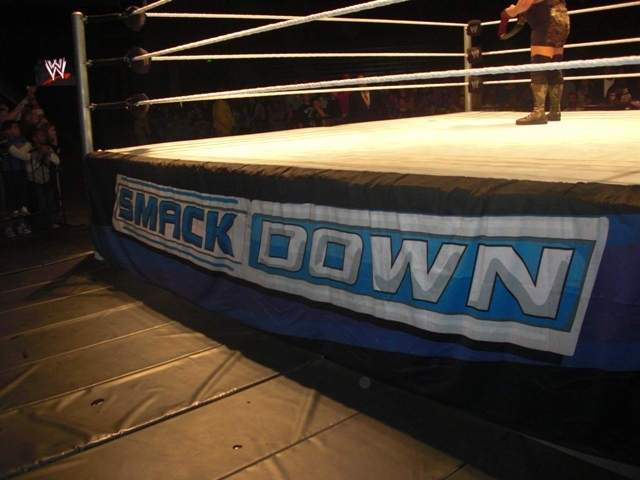 Below I have included a few pictures I took at Smackdown. Hopefully my story and these pictures will bring back some memories for you. I would love to hear some of your greatest WWF memories, so please click on the comments section below to write. Wrestlers hitting the barrier that my feet were resting on!